For many pool owners, Labor Day (or soon after) is when they will close, or winterize their pools. Understanding the proper steps to take, what winterizing chemicals to use, as well as understanding the pH and alkalinity levels are very important. Properly closing your pool will reduce the chances of corrosion or scale buildup. There are pool winterizing kits, winter pool covers, and steps and procedures to ensure your pool is ready for it’s winter sleep. Closing your pool Properly closing your pool can eliminate costly repairs when you reopen it during the springtime. Ensuring that you close your pool as soon as the weather cools down is important, as it will prevent freeze damage and allow you to properly shut your pool down. Be sure to check for special instructions when closing your in ground or above ground pool. Test your water. You need to make sure that your pool is going to go into hibernation mode with a clean slate (so to speak). Before you do any thing to winterize your pool make sure your chemical levels are in the correct ranges. If you need your pool water tested, make sure to stop in at your nearest Viscount for our computerized water testing. 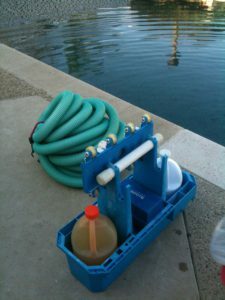 The best way to make sure you get all the pool chemicals you need is by getting a pool winterization kit. You’ll get all the chemicals you’ll need to make sure your pool’s chemical composition will survive the winter and be ready for Spring when you open it. We here at Viscount West have made our own pool chemical winterization kits for your convenience! We also recommend utilizing a turbo shock if needed, which is why it’s important to get your water tested before beginning this process (see water testing above). Winter pool covers give you an extra layer of protection you’ll need to get your pool through the harsh Michigan winters. These covers are used on above ground and below ground pools alike. Winter pool covers keep debris that can change your chemical composition over the winter out of your pool. We recommend not skimping on your next pool cover. This purchase (while very important) reflects the saying “You get what you pay for”. If you get a “cheap” cover, you’ll be looking at potentially having to purchase a new one every other year (if you’re lucky). We’ll soon be stocking the ultimate winter pool cover brand Armorkote. These guys are made tuff for above ground and below ground pools and with a ten year warranty, you know you’re in good hands. Right now at Viscount West we are offering 50% off ALL of our pool covers. So if you need a new summer pool cover or a new Winter pool cover now is the time! Viscount Pool’s has everything you will need to properly close your pool for the winter. If you have any questions regarding proper pH, alkalinity, or calcium hardness for your pool, be sure to ask one of our professional staff members. Also, be sure to check our great offers for limited time deals on pool closing accessories or chemicals.